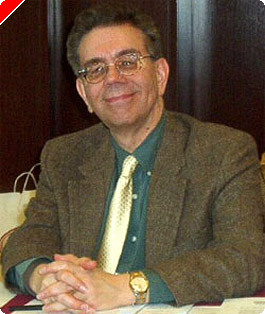 This article originally appeared on Pokernews.com, January 9, 2007. 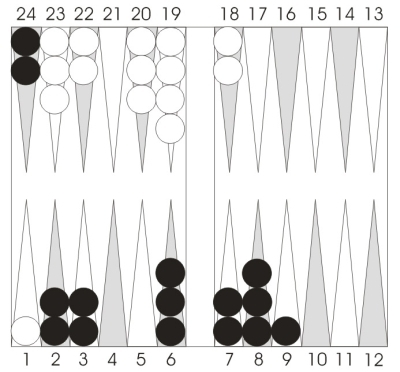 A lot of backgammon positions are pretty simple: the right play is either forced or completely obvious. Many others involve a clear decision between two very different alternatives. These problems may be hard to solve, but at least the choices are clear. Some positions, however, involve a lot of possible plays, all of which are somewhat reasonable. These positions can be very tricky, and one of the dangers is overlooking the best play altogether while sorting through the wealth of possibilities. Be alert, and try to enumerate all the plays before starting to rank them. Here's a choppy-looking prime against prime game, in which neither side is particularly satisfied with their position. White's not likely to fill in his 4-point, while Black has big gaps on his 4-point and 5-point. 53 is not an especially good shot, although Black can try a few things. What to do? Let's consider some of the plays that come to mind..
24/16 is a really bad idea. Black's 34 pips down in the race, so trying to disengage isn't a super plan to begin with. And suddenly, some really bad shots become great attacking numbers51, 65 and the like. Throw this idea out. 9/6, 8/3 is safe, but that's about all. Black's still way behind in the race, and now his front game looks like it will never come together. 9/4, 7/4 is betterBlack swaps the 7-point for the more valuable 4-point, and his position becomes a lot less awkward. But filling in the 5-point or the 7-point is now quite unlikely, so Black's game is probably as good as it gets. If Black stops his analysis here, he'll likely play 9/4, 7/4. Not bad, but he won't even have considered the best play! The right idea is 9/4, 8/5, the hyper-aggressive double-slot! Black seizes his last chance to get a really strong position. Suddenly the pressure is on White to throw a three or a four immediately. If not, Black's position will suddenly improve to a 5-prime or even a 6-prime, and White will be squeezed and crumbling. Even if White does hit, Black now has a pretty-good ace-point game with reasonable timing. The double-slot loses a few extra gammons, but picks up a new win for every gammon it loses. It's the clear winner.